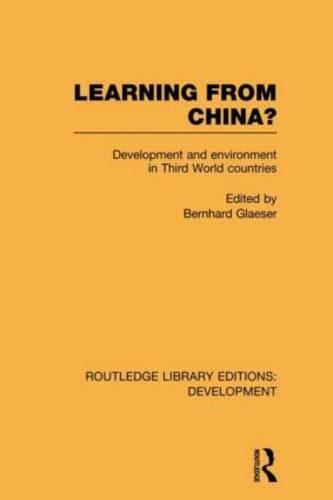 First published in 1987, this volume was written to shed some light upon the nature and environmental consequences and wider relevance of development strategies in the Peoples' Republic of China. It covers industrialisation, food production, energy use and landscape and settlement planning. The Chinese "autocentred" strategy is assessed from both the developmental and the environmental viewpoints. Decision-making processes and the opportunities to implement environmental policy in other parts of the developing world are analysed and the volume concludes with the view that benefits to other countries are likely to arise out of increased co-operation and exchange with China, although the Chinese model is by no means a panacea. All students and researchers interested in either environmental or developmental issues will find this book to be a substantial and enlightening contribution to literature.